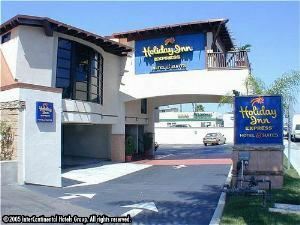 The Holiday Inn Express Hotel & Suites Solana Beach/Del Mar is centrally located near the Del Mar Fairgrounds, Amtrak station, businesses and local attractions. The hotel is within walking distance to the beach as well as many restaurants & shops. Del Mar, Rancho Santa Fe, La Jolla, Sorrento Valley are all 1 to 5 miles away. Our hotel, beach and local attractions offers you a truly Southern California experience! We provide easy access to I-5 and are approx. 15-18 minutes from downtown San Diego. The hotel showcases 80 spacious, brand new guest rooms and suites, each with its own balcony, refrigerator, microwave, coffee maker, iron & board, hair dryer and sofa bed (suites only) to accommodate any length of stay. All guests can enjoy our complimentary deluxe continental breakfast bar and free local phone calls. The beautifully landscaped pool and sun-deck offers the best in rest & relaxation. We even offer a fitness center for our health conscious guests. For our corporate clientele, a business center is available at a nominal charge.